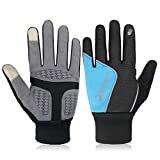 ✔ ALL-PURPOSE GLOVES: Suitable for Biking/Bike/Cycling, Track Cycling, Road Cycling, Mountain Bike, BMX, Motorcycle, Driving, Jogging, Workout, Hiking, General Workouts, Bodybuilding, Exercise, Fitness, Sporting.,etc. ✔ TOUCHABLE CONTROL FINGER, 2mm GEL PALM & ADJUSTABLE VELCRO STRAPS: The conductive metal fibers on the figer make you use the smartphone without taking off gloves. 2mm gel palm ensure the best grip and durability effectively. The magic tape can be adjusted to your own size. Trideer Biking Riding Gloves, Gym training fitness bodybuilding workout exercise glove are ideal for cyclists/men/women/ladies/female/trainers/athletes/beginners/fitness people. Why cyclists need to wear gloves? Because the thick pad on the gloves also can absorb the shock and reduce numbness in the hand. In addition, the gloves can be used to wipe the sweat and even protect riders from falling and sun tan(for female). All in all, buying a good pair of gloves not only can improve riding comfort, but also can increase the overall sense of clothing.